into a stand alone kitchen appliance like the mockup shown. As regular readers of Techlicious may know, I’m something of a health fanatic. I regularly use tech to help stay in shape, but there’s one piece of tech that always seems to work against me: the microwave. From zapped breakfast burritos to buttery popcorn to those not-so-gourmet personal pizzas, it seems like everything that comes out of the microwave sets me back on my goal. New technology from GE may make the microwave’s unhealthy aura a thing of the past. Researchers at the company, in conjunction with Baylor University’s Electrical and Computer Engineering Department, have developed a prototype device that uses microwaves to analyze the nutritional content of the food you heat, sending the data directly to your smartphone. The hope is that one day – one day soon – the tech will be built into commercially available GE microwaves or a stand-alone device. 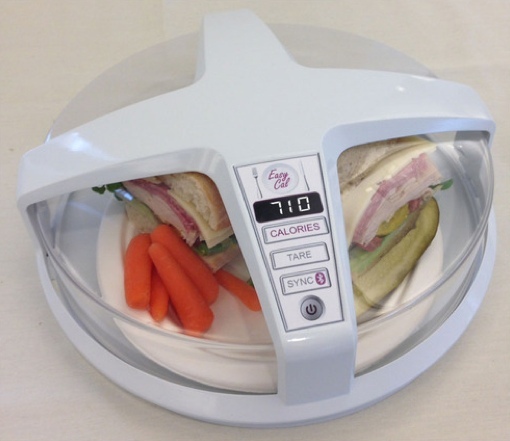 The scanner analyzes three aspects of your food’s composition: weight, fat content and water content. In trials, the tool was able to reference these measurements against a USDA database to come within 5 to 10 percent of the actual caloric content of the food tested. For now, the tech has a major limitation: Food needs to be homogenously mixed for the result to be accurate. That means the GE prototype works well with drinks and broths (much like the Vessyl smart cup), but not much else. Of course, GE scientists are working to fix that, perhaps through a system that will use an array of antennas to virtually blend the food. For more on GE’s microwave prototype, check out the article on the device in the MIT Technology Review and the short video below. For a great countertop microwave that you can buy today, check out the Panasonic NN-SE982S, our pick for the best currently available. The discussion about weight loss is finally converging on the scientific truth that, at the end of the day, you need to eat less calories than you burn to lose weight. Yes, this is a complex equation with a lot of variables, but eating less than your calculated total daily energy expenditure is a surefire and very simple way to lose weight. The problem is that right now tracking calories is a pain. Talk to any fitness model who has to weigh their portions on a food scale every day in order to make sure their diet is on point. It also makes dealing with social situations a challenge for anyone trying to lose weight. Imagine a day when we could scan a restaurant plate with our smart phone and get the calorie count instantly. It would revolutionize weight loss and make it so much easier for the average person.